Future Point has launched Leostar Expert Edition for experts which is latest and very advanced edition of popular astrology software Leostar. 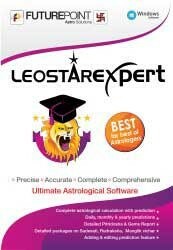 Leostar Expert Edition for experts is upgraded version of world number one vedic astrology software Leostar Professional. It contains all those facilities which are essentially needed and demanded by expert astrologers’ community. This software is upgraded business tool for a professional astrologer as it not only includes all the features of Leostar Professional essential but also gives comprehensive horoscopes like Bhrigupatrika, Kundalidarpan, Parashar Patrika etc. In addition to that the 30 year report of around 300 pages can also be obtained. Daily, monthly & yearly predictions have been introduced for the first time. Special detailed package for Rudraksha has been added. It contains Prediction Master which gives the full facility to add your own prediction with additional convenience of editing the predictions thus added. The layouts of page can be designed in your own style as per choice. Expert Edition gives the facility of printing horoscope in real book binding format in sectional form. Leostar Expert Edition gives Panchang calculations, reports and Festival Master Updating especially for Panchang makers. It also provides the facility of editing before printing. These advanced features make it more advanced package of Leostar and are available in its expert edition. All additional features of Leo star expert edition have been included in this module. It contains useful mantras for accomplishing various objectives . Special detailed packages Rudraksha readings have been added. It contains Prediction Master which gives the full facility to add your own prediction. Prediction Master also gives the necessary facility to edit your own prediction. The layouts of page can be designed in your own style as per choice. Expert Edition gives the facility of printing horoscope in real book binding format in sectional form. . It gives following comprehensive horoscopes- . 30 Year Report- 30 Year Report is most comprehensive Horoscope of astrological calculations and predictions along with all essential remedies. In a way it is a life book containing all sorts of astrological calculations with extensive predictions like Dashaphal and Transit predictions. Bhrigupatrika- Bhrigupatrika is basically a very comprehensive model of prediction and calculation.This about 200 page long Horoscope is the best model for complete and detailed calculations and predictions with Numerology, LalKitab, Astrograph and Yogas. Parashar Patrika- The astrological calculations available in this model of horoscope help to get a much better idea about the strength of the native’s destiny. Daily Horoscope- Daily prediction is done on the basis of transit of moon in order to analyse and predict day to day events. Monthly Horoscope- For getting predictions for a specific month the transit of Sun is considered most importance. Yearly Horoscope- For annual forecast the impact of transit of Jupiter, Saturn and Rahu on native’s horoscope is studied minutely.